The holiday season marches on in York this weekend with a bash that will light up the entire downtown. Plus, you can enjoy a day of history or a night sipping on some wine as you create an artistic masterpiece. Here are three ways to spend your weekend in York County, PA. The biggest First Friday celebration of the year will cap this week with Light Up York. 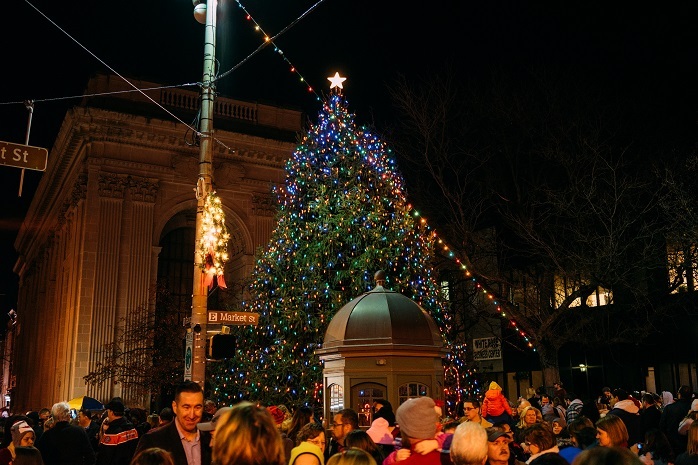 The city will light its 30-foot Christmas Tree on Continental Square, with family-friendly entertainment, complimentary hot chocolate and other holiday activities planned. Because it&apos;s First Friday, Central Market House and downtown businesses will keep their doors open later than usual. It&apos;s a great time to kick off the holiday season and find some one-of-a-kind gifts for everyone on your shopping list! This year&apos;s tree lighting will also feature the sealing of a time capsule celebrating York&apos;s 275th anniversary. Given that Friday marks the sealing of the time capsule, Saturday&apos;s a perfect time to check out the York County History Center&apos;s York City: 275 Years of History exhibit. You&apos;ll learn about the significant events, people and everything else that helped shape the historic city, once home to the Continental Congress. End your weekend on a relaxing note at Pinot&apos;s Palette, where you can bring a bottle of wine to enjoy as you paint a holiday masterpiece. Sunday&apos;s painting features an adorable owl surrounded by falling snowflakes - the perfect painting to add some cheer to the winter season! The fun runs from 7-9 p.m.